On Friday morning, I woke up at 7 am, had breakfast and got dressed, ready for an exciting day. My sister-in-law lives in a condo on the 34th floor of a tall building downtown Chicago, close to Division Street. This is where I stayed for a few days this past weekend. It is quite a convenient location, I must say, offering magnificent views of the city, a lovely outdoors pool on the 8th floor where I swam every day. In truth, the whole experience seemed surreal. It was only a few blocks before I reached the lake and when I arrived, I realized that I had forgotten how pretty it is, and how pleasant it is to walk along its white-sanded beach early in the morning. Lake Michigan is massive, like an ocean. Looking at it, you forget that you are still in a big city like Chicago. Un vrai poumon, a breath of fresh air next to miles of concrete. 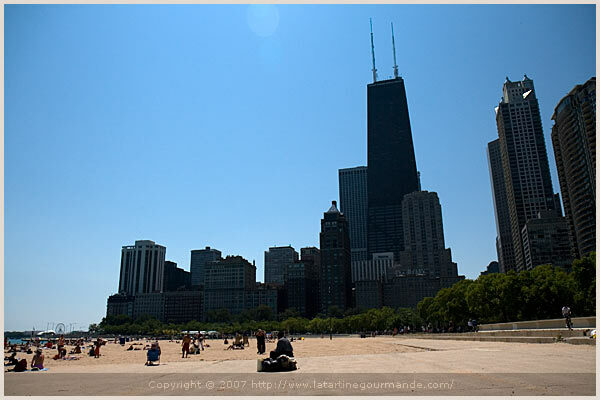 I really enjoy visiting this Midwest city, the “windy city” as it is referred to, perhaps also because this is the first place I lived close to when I moved to the States. The conference is now over, and I’ve just returned to Boston. Can I really summarize the weekend? It went fast and was full of great moments. From meeting food bloggers in person, finally being able to put a face on a name or hear a real voice instead of imagine it through words — my friend Lara of course and Elise whom I knew already and was delighted to see again, new people like Nicole, Kalyn, Alanna, Jasmine, Nupur, Catherine, Katie, Ruth, Susan, Gemma, Shuna, Claire and more names that I am sure I am forgetting — hanging out with P.’s sister whom I rarely see, to catching up with my great friend M., an old roommate from the time when she and I lived at the French House in Champaign. It was a collection of many good things. Both Lara and I were nervous before our food photography presentation. But it went well (from our point of view) and we hope, of course, that it met the attendees’ expectations. Within only one hour, there were so many things we wished we could have said and shared. There is so much to say about food styling and food photography. Hopefully, there will be other times. Thank you for attending! While Lara discussed some technical aspects of food photography, white balance, aperture and depth of field, talking about the differences between manual and automatic focus, shooting with or without flash, and Jan gave useful Photoshop tips, I focused more on the prep steps involved before a food shoot, giving tips that I learned along about food styling. Because to me, no matter how advanced a camera is, or how technically skilled a photographer is, without a good composition, a food image can be disappointing. How to compose an image is obviously something that varies from one person to another, according to our sensibility. We all have a different style and opinion of what looks good. For me? It is intimately tied to my strong attachment to Visual Arts. With slides supporting my presentation, I tried to give ideas on the how-to to make what I consider a well-balanced food photograph. Always ask yourself, what the food you are shooting means to you. Is it rustic, elegant, does it need to be eaten in the dish, on a plate, outside or inside? Look for colors that enhance the food. Perhaps the same color for the food and background, or matching colors. Use repetitive shapes, geometry and symmetry to make pictures interesting. Pay attention to balancing space between the food and props. Move objects around to play with different settings. Use textured backgrounds that give more life, and vary angles to shoot and frame the picture. Do not always shoot from the same angle. Overhead shots, front or side. Always shoot larger than the end result. Remember you can always crop the pictures like you prefer in post. Be playful with the food and showcase the beauty found in raw ingredients. Observe the natural shapes and forms in food. You do not need to show everything either. Suggestive cropping can really have a more powerful effect. I am sure that I am forgetting things. As a matter of fact, you can find plenty of information on our session here and there. Thank you for such a nice summary of our presentation. And so the recipe in this post will come as an example to try to explain my choices in deciding to style these savory muffins. Why did I show the molds in which the muffins had been cooked? To create the story from beginning to end. I did not clean the molds on purpose. I spent time arranging the pile in the background until I was happy with its looks. Why did I use a narrow depth of field? Because the most important thing is the muffins, and so using a selective focus is what I was after. Why did I show a muffin half-eaten? To make the reader and viewer participate. It could be as if you were eating the muffin too. Showing from top with an overhead shot also helped with the story I wanted to convey. Notice that I cropped to show only parts of the muffins. And I organized them in a horizontal line. Why the basil and tomato on top of the muffin? To suggest the flavors of the muffin (you would not use a fresh herb that is not used in the recipe). Why a geometrical pattern for the background? To repeat the round shape of the muffins. I discovered savory muffins while living in New Zealand, in the many cafés found everywhere in Wellington. I will always remember the first one I ate. What a great discovery it was. Since then, I have enjoyed experimenting with different flavors and ingredients. I am suggesting here a vegetarian version using parsnip — a too often forgotten vegetable, yet so tasty — sun-dried tomatoes, chestnut flour and basil. Easy to make, great for a party when cut in finger food bites, these muffins also accompany well any type of soups or salads, and make a treat at brunch. When I brought them as an amuse-bouche at our friend R.’s house, they did not last for a long time. I took it as a compliment. These muffins would also have been perfect as travel food. Airport food, I have said before, is not my best friend, especially this time when, on my way to Chicago, I was stuck for a few hours at the airport after my flight had been canceled. I hope to remember next year. The Blogher conference was great. A big thank you to all the Blogher organizers and attendees. It was an honor to attend and speak. In a large bowl, mix the eggs with the milk and oil. Add the flour, baking powder and mix to have a smooth batter. Add the parnsips, cheese, basil, sun-dried tomatoes and nigella seeds. Butter 6 muffins molds and coat with flour. Remove excess. Divide the batter between the molds and cook for 30 min, or until the blade of a knife inserted comes out dry. Remove and let cool on rack. Dans une jatte, mélangez les oeufs avec le lait et l’huile. Ajoutez la farine et la levure chimique et mélangez bien sans faire de grumeaux. Ajoutez les panais rapés, le fromage, le basilic, les tomates séchées ainsi que les graines de nigelle. Beurrez 6 petits moules à muffin et farinez-les. Enlevez l’excédent de farine en tapotant. Divisez la pâte entre les moules et enfournez pendant 30 min, ou jusqu’à ce que la pointe d’un couteau inserée ressorte sèche des muffins. Merci d’être passée sur mon blog! Je vais à Chicago Jeudi pour voir ma soeur and will try to keep all of these new tips in mind if I manage to do any food shooting while I’m there. Pingback: Still Life With... (Food Styling and Photography) » Thank you BlogHer! Great tips Bea. Wish I could have gone. Thanks for sharing your tips — wish I could have been there for your presentation. Je vis en californie depuis septembre dernier et j’ai ouvert un blog il y a 5 mois. A bientôt ! Thanks for these tips — I have been thinking lately about how to be more *thoughtful* in my photographs of my food, even with though I have few skills and an old camera. Your photos, here, as always, are so lovely, esp. the ones of the beach! Béa, it was wonderful to meet you and to attend your presentation. You and Lara did an excellent job. I just wish the session had been longer! Bea, I really enjoyed meeting you. Definitely, the session with you and Lara was the highlight of Blogher for me! I learned so much (and realized how much more I have to learn too!) I wish we could have a whole day of food photography next year! Tres jolie! Thanks for the tips and the also some ideas for an upcoming biz trip to Chicago. I’m going t squeeze in dinner at Frontera–but the farmer’s market and the beach! This is great, often times I just put the food down and try and figure out what ‘looks good.’ You’ve put things in much more concrete terms, and I’ll really be thinking of them next time I shoot. Big thanks! Well done. Some really great advice to the would be photographers. Great tips on food photogaphy. I also loved your pictures of my hometown Chicago. It is a beautiful city that you captured very well in your photos. Hello Béa – What a treat to see you again and to attend your session! I think it was my favorite session of the whole conference. You three were so “buttoned up” as they say, in other words, clear, concise, direct, and organized. I wish we had had the whole day with your session, and not just an hour. The workshop was wonderful and inspiring. I can’t wait actually use some of the tips! Your work is incredible and your joyful spirit is infectious. Always learning so much from you Bea. I wish I could have been there. Thanks for sharing your experience with us! Thanks for the great tips on styling & photography – there’s still so much to learn for me!! Gracious you are so thoughtful. I knew that but you’ve just demonstrated it so well again with just those few ideas. And your picutures of Chiago, oh my. Our son went to U of C there and started his company there, really love that town! Great beach, absolutely! Ha, ha Béa, I’ve found chestnut flour!! And you know I really am a savory girl at heart. Certainly like these muffins. I was sorry I couldn’t be there – I thought about flying back to the US just for the weekend! 🙂 Great tips as always, and the “live blogging” from your session was even more informative. Thanks for sharing your experience with us! quelle magnifiques photos! Apparemment tous s’est bien passé! It was such a joy seeing your pictures and your process – but painful to know that we didn’t get to eat any of the food afterwards, when everything looked so deliciously beautiful. Thank you so much for sharing. Merci pour les tips Bea. Et merci pour les photos surtout. Hi Bea! It was wonderful meeting you at the conference! What a great post this is! I’ve definitely taken some of your tips with me from the food photography session. Thank you so much! Merci pour toutes les recettes et les photos. Ca fait plus de 6 mois que je lis ton blog et tes recettes me rappellent la France. En esperant un jour te rencontrer lors de ta prochaine visite a Seattle. Twas great to finally meet you in person and of course be taught by you. It’s good to hear you don’t get these incredible shots on the first try, that it takes a long time and a healthy dose of patience is great. We saw another side of Chicago, so it’s lovely to see what you captured. Hope we can keep in better touch from now on! Salut! This post is great, but I especially wanted to thank you for the muffin recipe! Although I don’t care much for parsnips or sundried tomatoes, it was so inspiring (why didn’t I think of savory muffins?) that I made two different batches tonight to experiment. One has caramelized onions, goat cheese, and fresh thyme; the other has tomato, basil, a bit of red pepper, a touch of balsamic vinegar, and goat cheese. I foresee plenty of variations as the months bring different vegetables into season. Excellent advice Bea! I’ve always admired your photography, thanks for sharing your tips! Thank you all for your encouragements and generous comments! Merci beaucoup de vos encouragements et commentaires si genereux. How I appreciate your food styling tips, Bea! And Chicago looks beautiful! Bea–What stunning photographs, both of Chicago and the food! Thanks for the tips too. It was great meeting you at the dinner–what wonderful stories flew around the table! Béa, what a lovely post. It was great to meet you. Thank you for the very informative presentation. I learned a lot and it has inspired me to do some serious work on my photography skills. Thank you for the seminar and all the styling tips so clear and true. Béa, thank you so much for the informative tips you’ve posted here — since I couldn’t be there for the second day of the conference, and therefore missed your session, I was so pleased to pick up some tips from you in person at the Birds of a Feather lunch, and then further here on the blog — thank you! I have been such an admirer of your food photography for so long — it was an honor to meet you. Your pictures made me miss good old Chicago even more. And your post with its wonderful tips made me rue the fact that I couldn’t make it to your session. Your and Nupur & Kalyn’s sessions were the two I was most interested in attending. Perhaps next time! Thank you for this super post filled with tips! Bea, I’ve never been to Chicago & I only ‘know’ the city from the tv series ER, where it seems always rather grim, but your pics make me want to visit. It must be so nice to have a giant lake closeby. Your muffins look great (as always), and thanks for the tips – I always find it very inspiring to look at your compositions. “…pay attention to the balancing space of food and crops?” Do you mean food and Props? par quoi puis je remplacer le panais ? Thanks again all! Chicago is a beautiful city. I really like it! Vanessa, tu peux remplacer le panais par une pomme de terre douce? Un autre superbe billet très instructif à conserver dans mes favoris. Merci Bea, ce compte-rendu et tous les conseils que tu y donnes me seront très utiles, comme ils le seront à plusieurs autres personnes assurément! Thank you for your site, your words and images are a constant source of insipriation. and have been working everyday on still lifes to get better. I am hoping to start a blog soon. Merci mille fois for all your hard work and inspiration. You and others like Lara, are so very generous to share your work and tips with those of us like me, just starting out…! Chère Béa, ton talent m’interpelle et me jette par terre. J’aimerais en posséder une mince parcelle. Therese, thanks so much, and good luck with your project. A new blog is exciting! Tarzile, tu es bien trop flatteuse, merci beaucoup de ton gentil mot! Tu as plein de talent, crois-moi! This page had inspired me to do my rpoject on food styling. I am trying to figure out what i want to be now I see I was thinking about it but now I know. Thank you this page is wonderful. hey there! I really looove all your pictures. The colours are so vibrant and matches with the font and background. I like your way of photography too, DOF and all. You sure use all of your talent in photography n cooking in a good way. Your pictures inspire me. Your photography and the style of it is exquisite. I am inspired, and at presently aspiring to create and post images like yours on my blog. Wish I had your talents. Congratulations on your work, and best wishes to you. You have made me hungry, off to find something to eat. Terrific information and examples! Just what I will need when I tackle improving my blog’s photography.